Baked chicken wings are easy to make, and they come out crispy and delicious. Simply bake them in a 400°F oven for 40 minutes. There’s no need for flour! 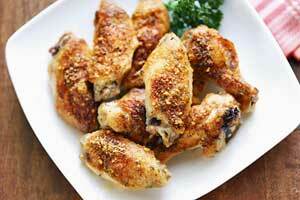 Baked chicken wings are healthy, easy to make, and they come out crispy and delicious. My entire family loves them, so I make them quite often. Simply bake the chicken wings in a 400°F oven for 40 minutes. If you want them super crispy, once they’re done, lower the oven to the “keep warm” setting (170 degrees F) and keep the wings in the oven for 60 more minutes. But how do you make chicken wings crispy in the oven? There’s no need for flour when making these crispy baked chicken wings. The skin will crisp up beautifully in the hot oven. And as explained above, keeping them in the oven on the “warm” setting after they’re done will crisp them up even more. So I highly recommend it. Baking is easier than frying! I love baked chicken wings and make them often, but I actually started making them out of sheer laziness. My family loves chicken wings, but I hate deep frying with passion. I also prefer to avoid breading, keeping the chicken wings not just gluten-free but also low carb. So I decided to simply season the wings, and bake in a hot oven. Surprise! They came out of the oven crispy-skinned, juicy and absolutely delicious. They are certainly healthier than battered and fried chicken wings. Those are often fried in unhealthy vegetable oils. Apart from the basic nutrition info that you can see below, a serving of this recipe has lots of important nutrients. It has about 40% of your daily needs of niacin and selenium. 20% – 30% of vitamin B6 and phosphorus. And 10% – 20% of riboflavin, zinc and iron. What to serve with oven baked wings? If you serve baked wings as an entree, rather than an appetizer, you can serve them with lots of yummy side dishes! A few of my favorites are olive oil broccoli salad, shirataki mac and cheese, and cauliflower tots. You can dip the baked chicken wings in buffalo sauce to make tasty buffalo wings, but it’s not really necessary. They are perfect just as they are, straight out of the oven. Leftovers keep well in the fridge, in an airtight container, for 3-4 days. They are not as good as when freshly baked, and I actually prefer to eat them cold, because microwaving them dries them out. Baked chicken wings are easy to make, and they come out crispy and delicious. Simply bake the chicken wings in a 400°F oven for 40 minutes. There's no need for flour! Preheat oven to 400 degrees F. Line two rimmed baking sheets with foil and fit the baking sheets with wire racks. If your chicken wings are whole, cut the tips off, and separate the drumettes and the flats (here’s a good video that shows how to do that). 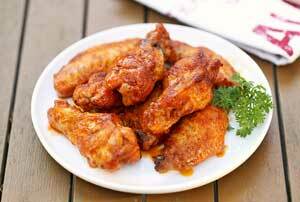 In a large bowl, toss the chicken wings with the melted butter, salt, pepper, garlic powder and paprika. Arrange the coated chicken wings in a single layer on the wire racks, not touching each other. Bake until the skin is browned and crispy, about 40 minutes. Serve immediately. For extra crispy baked chicken wings, after baking the wings for 40 minutes, lower the oven temperature to the "keep warm" setting (170 degrees F), and keep the wings in the warm oven for 60 more minutes.